Image caption President Mattarella urged parties to rally behind a "neutral government"
Italy's coalition-building talks have failed, leaving the country facing fresh elections or a neutral caretaker government until the end of the year. 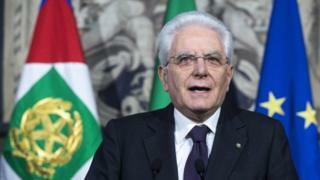 President Sergio Mattarella said on Monday that those were the only two options left after a third round of negotiations were unsuccessful. No single party or alliance won a majority in the March general election. The most influential parties, Five Star and The League, favour a new vote in July. Mr Mattarella has the final say. Following the latest round of talks aimed at forming a coalition, the biggest single party, the anti-establishment Five Star movement, could not agree on joining forces either with the right-wing alliance of Forza Italia and The League or with the centre-left Democratic Party. Previous attempts to break the deadlock since the inconclusive result on 4 March also came to nothing, with the parties' starting positions reportedly remaining unchanged. What does Italy's election result mean? In a televised public statement on Monday, Mr Mattarella urged party leaders to rally behind a "neutral government" after conceding that there would be no coalition deal. "We can't wait any longer," he said. "Let the parties decide of their own free will if they should give full powers to a government... or else new elections in the month of July or the autumn." A caretaker administration would be made up of policy experts appointed by the president. It would have the responsibility of drawing up a 2019 budget with the aim of avoiding the possible "recessionary effects" of a scheduled increase in sales taxes later in the year, Mr Marrarella said. Such a government would run until the end of the year and would then dissolve ahead of elections to be held at the start of 2019, Mr Mattarella added. However, neither the Five Star movement nor The League have yet shown any interest in supporting the move. Italy election: What does the result mean?